Select your preferred subscription option, digital or print, below. You can also try us out with a free 3-month trial, or register as a Pipeline Member to access our website content. Contact Center Pipeline brings you unparalleled access to the fast-moving trends shaping the contact center industry. Contact Center Pipeline is a monthly instructional magazine focused on the specific needs and challenges of the contact center. Pipeline’s sole purpose is to address the information needs of contact center professionals by providing meaningful, instructional content to aid in the day to day contact center operations. This content is developed by a team of industry veterans who offer their expertise in each issue, along with a list of highly respected contributors — all of whom are known for their unique understanding of the industry. Each issue reports on key trends affecting the industry, best practices and successful solutions to the everyday challenges and pain points associated with running a contact center in today’s rapidly changing business environment. The Pipeline’s monthly editorial lineup includes columns exploring the essential contact center management areas, such as strategy, technology, workforce management, training, performance, management ROI, leadership and more. Interested in a group or corporate subscription? If you are renewing your current subscription, your new subscription will begin when your current subscription ends. If you need help with your order, feel free to contact us directly at 443-909-6951 (M-F 9am-6pm EST). Like Pipeline? You'll love the Magazine. Our Digital Subscription gives you unlimited access to current and past issues of our award-winning digital magazine, and unlimited, anytime access to every article we've ever published. Access is for one year or purchase two years and save. Join today! Pipeline Magazine: Our award-winning print magazine in digital format will be delivered each month right to your inbox. Unlimited Feature Articles: Read any Pipeline article, anytime, with unlimited access to current and past issues, including hundreds of articles, surveys, reviews, interviews, and other premium content you won't find anywhere else. Offline / Downloadable PDF Issues & Articles: All of the content and design of our award-winning print magazine and article library, available to download in PDF format, perfect for printing or to save for offline reading. Exclusive early access to Contact Center Pipeline events. Discounted access to Contact Center Ideas and Innovations Tour events. Subscribe to our print edition and get the ultimate Pipeline experience—all the great digital benefits along with the award-winning Pipeline print magazine, delivered right to your office, monthly. The print edition means experiencing Pipeline with all of the context and satisfaction that only paper can provide. With in-depth articles from the industry’s top thought-leaders alongside brilliant, full-color illustration, this is our ultimate offering for contact center industry professionals. With brand-new original contributions in your hands, you can explore the trends that intrigue you most, in your own time and place. Each yearly subscription consists of twelve print issues. A print subscription includes all of the benefits of the Digital Edition for free, including all magazine and article downloads. Pipeline Magazine: Our award-winning magazine delivered monthly in print and digital format. Complimentary access to Contact Center Ideas and Innovations Tour events. Print subscription available to U.S. and Canada only. Prices may vary based on the delivery location and frequency. Other restrictions and taxes may apply. No commitment required, cancel anytime. Not sure which subscription to choose? Want to give us a test drive before subscribing? 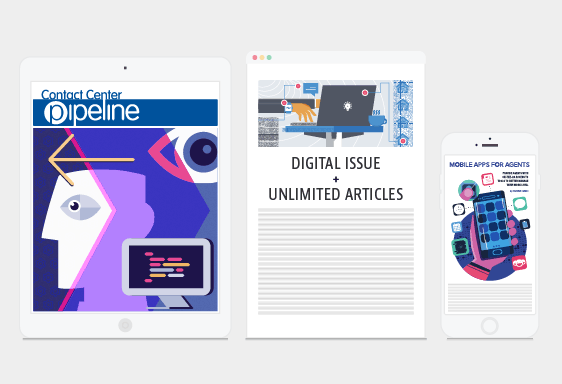 Try our all-access digital subscription for three months, including unlimited article access anytime, anywhere via www.contactcenterpipeline.com and three free digital issues of Contact Center Pipeline Magazine. Sign up now to become a Pipeline Member and get FREE unlimited article access anytime, anywhere via www.contactcenterpipeline.com. Membership includes access to exclusive survey data and analysis, reviews, interviews, blogs, and other premium content from Contact Center Pipeline. Members also receive exclusive early access to Contact Center Pipeline and Ideas and Innovations Tour events.